And now what are you waiting for? 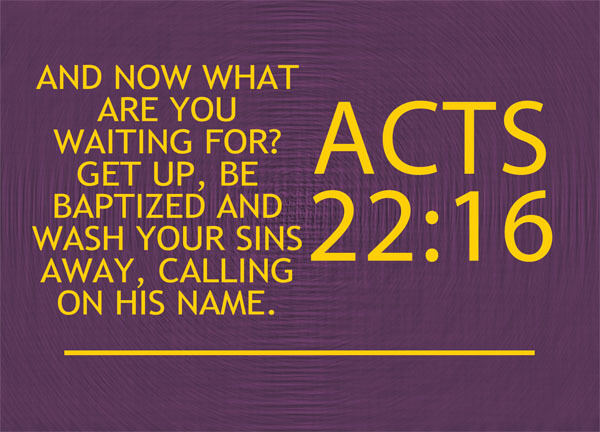 Get up, be baptized and wash your sins away, calling on his name. Acts 22 starts off with Paul’s speech to the Jews in Jerusalem, after suffering through a mob that was targeting him based on some false accusations. Here Paul recounted his life story – a truly astonishing and amazing story about how one of the fiercest persecutors of the faith became one of the most zealous evangelists. He did not get to speak about the things he had done or gone through since his conversion, but perhaps it was his conversion itself that was his main point to all the Jews who were against the gospel of Christ. In today’s study, we will look specifically into Paul’s story, and one of the lines that Ananias – his benefactor, sent by God to aid him [Acts 9:17] – said to him, which spurred him into action. And now what are you waiting for? – Often we seem to be waiting, don’t we, but we don’t know what we are waiting for. Often we know what we should be doing, but our instinctive reaction is to wait, is to dally, is to stay in our comfort zone. What are you waiting for? What are we waiting for? Sometimes we may be able to give an answer. We’re waiting for our family to be in a stable situation. We’re waiting for money to come. We’re waiting for the riots to end. Yet even the most pragmatic reason is but just a weak excuse when it comes before the kingdom of God. I can imagine Paul, or Saul, as he was still called then, must have been bewildered and in disbelief by the chain of events that were happening. Put yourself in the man’s shoes for a moment – you who were carefully groomed in the ways of the law, do not believe in the gospel of Christ, and you look upon these people as ignorant rioters out to create trouble. Imagine suddenly seeing the vision of the very one whom you so opposed, suddenly understanding that you had been wrong in all your previous acts of persecution, being blinded by the brilliance of the light, being prayed for by Ananias and suddenly being able to see again – most importantly, being told to ‘get up, be baptized, wash sins away, call on the Lord’s name’. It’s quite a lot of things happening, no? Get up – Christ first told him this [Acts 22:10], because Paul had fallen to the ground when the light from heaven flashed around him on the road to Damascus [Acts 22:7]. We were not given any information as to why Ananias told Paul to ‘get up’, but it was likely that he was physically lying down or sitting down, and pretty much shell-shocked or in a trance – probably even with his mouth agape. Christ had told Paul that when he got into Damascus, he will be told all that he had been assigned to do [Acts 22:10] – and indeed, the very first thing he had to do, was to ‘get up’. Physically, certainly, but also spiritually. Get up. Rise up. Stand up for the Lord. Be a presence for God. Stop dallying around. Stop lying around. Stop hiding in your comfort zone. Stop being safe and sheltered. Get up. What are you waiting for? There’s nothing to wait for. be baptized – Paul was obviously not baptized yet at this stage – he had been a believer for as long as he had been in Damascus, and he had not met anyone who was able to baptize him – until Ananias came to him. He probably didn’t even know what was baptism and all that it stood for until Ananias came to him. The baptism of Paul is very significant – baptism itself is very important in Christianity. Later on, Paul would baptise others as well as preach on the topic of it, and all of that began the moment he was baptized. At which point was Paul saved? Many people argue over this, but it was more likely at the point of the vision, when he saw Christ, then the point of baptism. Salvation has nothing to do with baptism – how many times have we been told that salvation is not by works, not by anything we do, but by the grace of God through faith in Christ Jesus our Lord? If we can only be saved by being baptized, then the entirety of the New Testament would be a fallacy. Yet baptism is so important that it was the second thing that Paul has to do. Why? wash your sins away – Baptism is the symbolic act of having our sins washed away by the Spirit. The original Greek word actually means washing as well. Today baptism is pretty much regarded as the Christian rite of admission – a confirmation of our faith. While it wasn’t that much different in Paul’s case, it was more like he needed to be baptised immediately so that he can begin doing God’s work. Paul was a man with a past no better than a lot of Christians. How many of us could claim to once be a man who actively and fervently persecuted Christians, throwing them in jail, oppressing and opposing them – and most significantly giving the approval for killing Stephen? For I am the least of the apostles and do not even deserve to be called an apostle, because I persecuted the church of God [1 Cor 15:9]. He knows that. But when he was baptised by Ananias, his past sins were washed away, and he is given a new mission. But one thing I do: Forgetting what is behind and straining toward what is ahead, I press ontoward the goal to win the prize for which God has called me heavenward in Christ Jesus [Phil 3:13-14]. calling on his name – whose name? The name of the Lord, of course [Joel 2:32]. These were the first things that Paul was asked to do when he regained his sight after his conversion. How long has it been since your conversion? Or maybe you never had a moment of Damascus, like Paul did – because you were a second generation Christian. I am a second generation Christian, and while I can’t quite pinpoint a specific moment in my life, there was certainly a period of time in which Christianity became my faith and not my parent’s. Perhaps you have been baptised. Perhaps you have been calling on the name of the Lord. But, have you really, honestly, gotten up? From the old life, from your comfort zone, from the stagnancy, from the lies the sins the dark path? When it is difficult for us to get up from bed, it’s a sign that we’re physically or emotionally tired. It’s not that much different spiritually, is it?